It's been about 15 years since James Wesley, Rawles' novel Patriots appeared on the scene. Through the years, that book and the author have taken on iconic status in the preparedness community. 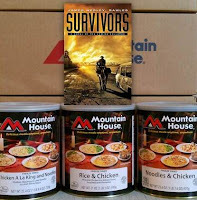 Now Jim's long-awaited sequel is about to be unleashed, and we're providing free hardcover copies with qualifying purchases of our new Mountain House 3-can packages ... a practical package that also includes an Aurora Firestarter! 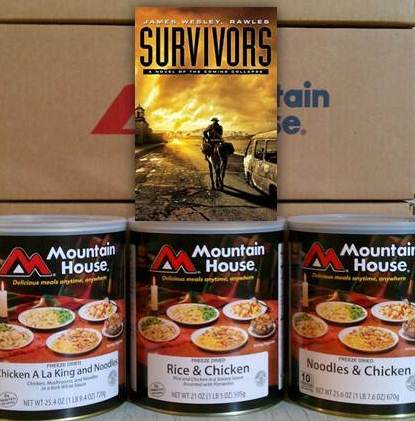 These full packages will begin shipping complete October 4--the official release date for "Survivors: A Novel of the Coming Collapse." We have a limited number of copies of the book ... orders will go out in the order they are received. The queue begins here, now. Get your order in early. We wanted you to be one of the first to receive a copy of something we believe could change the 2012 election -- and many elections after that. It's about reclaiming the Constitution from scofflaw government. The political establishment is now openly contemptuous in its disregard for the Constitution. Elected officials, judges and bureaucrats have corrupted the law that is supposed to protect society and our freedoms. Many private lawyers commit the moral equivalent of legal malpractice by aiding lawbreaking by the political establishment. In some political campaigns we now hear talk about American exceptionalism and constitutional conservatism, but too few candidates explain the link between these important ideals. The left wants to destroy American exceptionalism, and attacks constitutional conservatism. We need candidates who understand and can articulate what constitutional conservatism is all about. 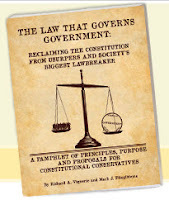 The pamphlet starts this way: "Government is the oldest, largest and most pervasive lawbreaker in America." We take on the entire political establishment in our no-holds pamphlet describing how government is now society's biggest lawbreaker; so big that nothing is a close second. Based on decades of experience fighting government lawbreaking in the name of free market conservative principles, we set forth some new ways of thinking, and perhaps confirm what others already know, about why America's exceptionalism is in decline, and how the constitutional conservative movement is the last, best chance to save our country. 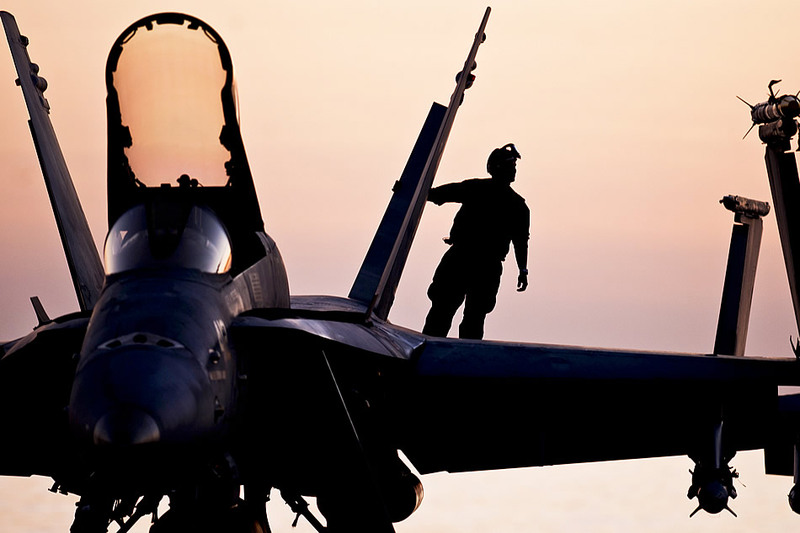 We put these ideas in the context of what constitutional conservatives know to be true. Our pamphlet links great thoughts and ideals from the 18th Century English giant, Sir William Blackstone, through James Madison and Thomas Jefferson, to the modern conservative movement that began in the 1950s, and now to the Tea Party. We have set forth these ideals in a way that applies right now. It's called "The Law That Governs Government: Reclaiming the Constitution from Usurpers and Society's Biggest Lawbreaker." Here is a link to an excerpt from the introduction, which we call "The People's Opening Argument." 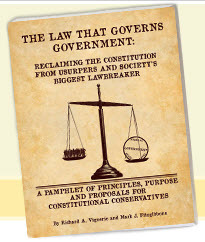 The entire pamphlet itself, which is available at ReclaimtheConstitution.com, includes one appendix with 30 questions people may ask candidates for federal and state office to test their knowledge of, and fidelity to, the Constitution and constitutional conservative principles. We provide another appendix with over 200 items showing government lawbreaking, but that doesn't even scratch the surface of our scofflaw government. Above all else, our pamphlet is about what James Madison described as the remedy obtained from the people for the violations of law, the theft of our rights, and usurpation of constitutional authority. Our principal goal in writing this pamphlet is to help launch an effort to push the Constitution into the center of the 2012 election. We're planning a major marketing, PR, and advertising campaign to make the failure of most of our political leaders to follow the Constitution an important issue in the 2012 primaries and general election. To begin this effort, we're writing to people of influence such as yourself, urging them to do what they can to inform and educate others. To encourage you and others to get this message out, we're not copyrighting our pamphlet. We want to encourage you to make whatever use of it you wish with or without attribution. This Constitution Day, it's time to do more that curse the problem. It's time to reclaim the Constitution. Hyperinflation is Here: 37% Money Printing Hike! "Fri., Sept. 16: I'm going to have to start off with a four letter word this morning, so if you're offended by hard, brutal truth being spoken, then skip this part: New data just posted by the Fed shows we are totally, irrevocably fucked: The Federal Reserve M1 3-month printing rate is up to 36.7 percent annualized!!!! What's more the 3-month M2 printing rate is screaming along up 23.3% basis the three month rate annualized. "Where the hell is our MSM cadre of so-called business reporters and editors when abominations like this are rising up in the economic data?" Read George Ure's Urban Survival post. 9-11 Ground Zero: Paul Simon Plays "The Sound of Silence"
The next three weeks in the Middle East - namely Israel, Cyprus and Turkey, may well provide far more excitement than any of us want. With the High Holy Days beginning on the 29th, this always seems to cause Security to go into high gear in Israel, but this year even more so than usual. The so-called "Palestinians" asking the Arab controlled General Assembly of the United Nations to recognize them as a State is certain to cause riots, if not war, to break out here in Israel. And if Obama betrays Israel and does not veto this in the Security Council the bloodbath could begin right away. Hamas and Hezbollah will cut loose with all they have to back-up the PA in their determination to destroy the State of Israel. It has also become obvious that Turkey is playing a very dangerous game to gain the upper hand in the Arab and Muslim World. Read the whole report from Jerry Golden in Israel. September 6-8 Mountain House Sale; 3 Ways to Save! 1. September 6-8 only, Safecastle is offering the maximum-allowed 25% discounts on MH cans (and on pouches too)! 2. No matter what quantity you order, you get FREE SHIPPING (to the lower 48). 3. Plus, Safecastle Royal Buyers Club members reap substantial benefits from two separate incentive programs ... first--the Royalty Rewards program which this time around offers $50 gift certificates for every three MH can cases ordered--no limit. Second, as with all purchases in our store through 2011, purchases count toward our unique Cache Back program for members.